Nokia to release Windows 8 tablets this June, top drawer Lumia in the works? As far as tablets go, a couple of interesting things are going to happen between now and the holiday season. One, we're going to see a glut of smaller 7- and 8-inch tablets running Honeycomb (like this, this and this) hit the market. And if the Kindle Fire and Acer Iconia Tab A100 are any indication, they're going to be cheaper, making slates palatable to folks who previously couldn't bring themselves to spend $500 on a plaything. The Archos 80 G9, then, is the perfect specimen on both counts. Here you have an 8-inch tablet running Android 3.2 with a kickstand and full-sized USB port -- costing just $300 for the base model ($270, even, on sites like Amazon). So how does it stack up against other diminutive, aggressively priced tablets? Let's see. How would you rate the 80 G9? In conversations with Archos before we began this review, we were presented with a choice: we could try either the 8-inch 80 G9 or the 10-inch 101 G9. While we haven't ruled out the possibility of giving the latter a whirl, our gut told us to start with the 8-incher. Why? Well, to be honest, we haven't seen that many of them. 10-inch slates come a dime a dozen, and though we've only tested a handful of 7-inchers, the market will soon be overflowing with them. But 8-inch tablets? Not so much. So here we are, getting acquainted. Archos' tablets have always strayed from the slab-of-glass look made popular by the likes of the iPad 2 and Galaxy Tab 10.1. And if you've been following along, you know the 80 G9 isn't that big of a departure from the 70 and 101 tablets we reviewed last year. The large lettering on the back cover has carried over, as have the bezels, which are wider in landscape mode than in portrait. 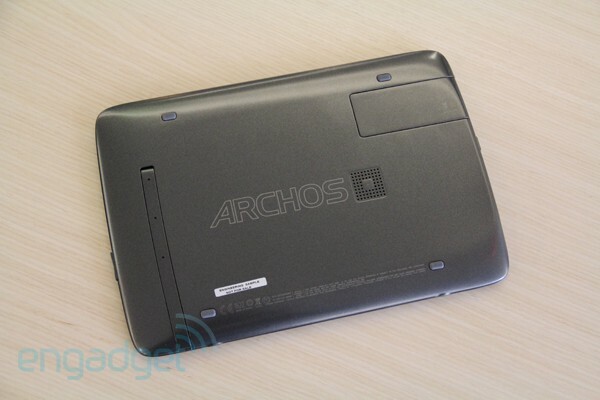 This time, though, Archos traded the brushed metal back for smooth plastic. But, there's more here than meets the eye. Lying just underneath that plastic is a layer of stainless steel, which makes the entire tablet feel rigid. There are two exceptions to that, actually, but they're both understandable. These pieces -- a kickstand and USB slot (more on both in a moment) depress ever-so slightly when you bear down on them with your fingers, and make a faint creaking noise in the process, but otherwise the lid feels reassuringly solid. It's also worth noting that the kickstand feels firmly attached - we tried flexing it backward, like a schoolyard bully bending our fingers the wrong way, and the blessed thing stayed put (you know, like our fingers). 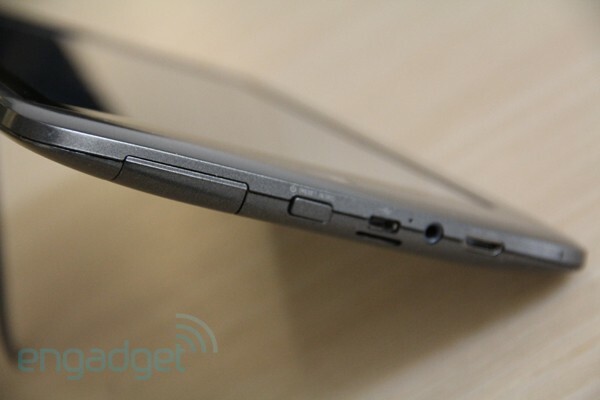 'Round back, you'll find that kickstand -- a fixture on older Archos tablets -- as well as a pull-out slot revealing a full-sized USB port. If you're based in Europe, you an buy can Archos-made USB 3G stick into which you can insert your own SIM (Archos confirmed this won't work in the US). An Archos rep also said the company's working on an LTE, carrier-subsidized version for the states, but for now, third-party USB 3G sticks (for the European market) should work, even if they do protrude awkwardly. Lingering on the back cover for a moment, you'll find four small, rubberized feet, along with a lone speaker. If you hold it in landscape mode, you'll find most of the action lies on the left edge, which houses the aforementioned USB / 3G slot, a power / lock button, a micro-USB port, microSD reader, headphone jack and a mini-HDMI socket. In fact, with the exception of a volume rocker on the opposite edge, the tablet's sides are blank, making for a (mostly) minimalist look. Ironically, given the abundance of unused space, we wish Archos had placed the volume buttons a touch higher, since they're all too easy to press by accident if you're holding the tablet in landscape mode. Speaking of minimalist, the 80 G9 has a 720p front-facing camera, but not a rear-facing one -- an obvious trade-off for scoring a Honeycomb tablet this cheap. Given the abysmal image quality we've been treated to in most every other tablet, we can't say we're disappointed Archos dropped this pretense altogether. All told, the tablet feels light in the hands, though we're finding that the 8-inch form factor is just big enough that typing in landscape mode feels unwieldy in a way it doesn't with 7-inchers. Like its 10-inch sibling, the 80 G9 has a 1024 x 768 MVA LCD panel, which was bright enough for us to see outdoors on a sunny day. Even without the kickstand, you'll find that the viewing angles are pretty versatile, especially from the sides, though we'd be lying if we said that stand didn't help. Certainly, it's more than just a differentiator, a gimmick -- even in our brief time with the tablet, we found ourselves regularly using it to prop up the tablet on our coffee table or desk while we leaned back and used our hands for other, more pressing things (you know, like typing this review). Particularly given that tablet makers can easily get away with selling an external dock for $30 or even $50, it's nice to have this kind of convenience built in. As for audio, the sound quality is predictably tinny, though we were more concerned by the volume -- we had to crank it to the max to make our music rise above the whirring of our air conditioner, though if you're listening outdoors you might well be using headphones anyway. The 80 G9 packs the same dual-core 1GHz Texas Instruments OMAP 4 SoC found in the LG Thrill 4G. In general, the display felt responsive and the tablet was brisk enough in opening apps and transitioning between menus and home screens. Look hard enough and you'll notice some delay when switching between open apps. (As it happens, the latest firmware update actually promised to address memory management.) If benchmarks tell at least part of the story, its numbers generally trailed the 7-inch, similarly priced Acer Iconia Tab A100, though in some metrics, such as the mobile browsing test Vellamo and the graphics benchmark Nenamark 2, the difference was pretty negligible. By the way, guys, mid-way through working on our review we upgraded the firmware from version 3.2.22 to 3.2.46, but didn't notice any significant difference between either set of benchmark scores. The 80 G9's battery eked out seven hours and six minutes in our battery rundown, which involves playing the same movie on repeat with WiFi on, Bluetooth off and the display brightness fixed at 50 percent. That's with the latest firmware, mind you -- before we upgraded from 3.2.22, we were getting just five hours and 45 minutes of runtime. In any case, its most recent score is still hours less than what you'll get from an iPad 2, but it more or less matches the 7-inch BlackBerry PlayBook. It also managed to outlast the similarly sized 7-inch Acer Iconia Tab A100 and the 8-inch Velocity Micro Cruz T408 by about two hours. So, in the grand scheme of tablets, its runtime is mediocre at best, but compared to models in its size class it's downright impressive. Like so many other 7- and 8-inch slates trickling into the market, the 80 G9 runs Android 3.2. (Happily, Archos has upped the specs since it announced the tablets in June, at which point it was touted as running 3.1.) You might also be relieved to know that the company has barely tinkered with the stock Honeycomb UI you're used to. The keyword being "barely." Archos did give Google's native music and video apps a facelift -- a much-needed one, at that. Taking a cue from Cover Flow, the new apps let you navigate your various libraries by swiping through album covers or, alternatively, movie jackets. In the case of both movies and videos, it offers separate folders for internal and external storage as just another shortcut to finding what you want. On top of that, Archos threw in optional widgets that let you scroll through albums and movies right on your home screen. Just tap a thumbnail to start playing something. It's a nice touch, we have to say, and both widgets quickly found a home on one of our secondary home screens. If it's not your thing, you can just ignore it. If only all software tweaks were that simple. As for apps, you won't find much beyond your garden-variety Honeycomb staples here. We point this out just because some tablets we've tested recently -- the IdeaPad K1 and the Toshiba Thrive, to name two -- have bundled various popular apps (and yes, some bloatware, too) as a kind of value-add. 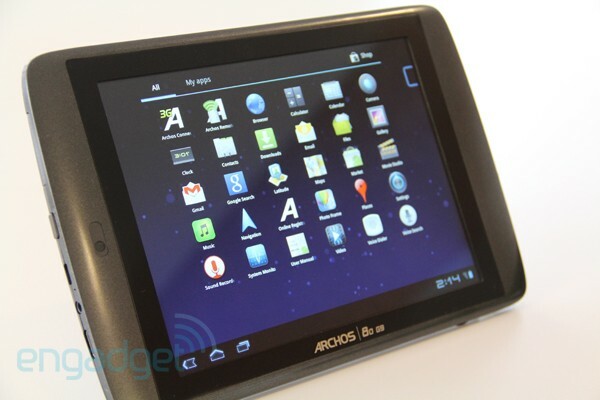 Of course, the Archos 80 G9 is well-made and cheap with acceptable battery life, which makes it plenty valuable already. One trade-off you'll make in exchange for walking away with a $300 tablet: this guy has only a front-facing camera for video-chatting / grainy self-portraits. In conversations with the company, an Archos rep reminded us that this is not a camcorder, and that if people want to take photos, they'll use their smartphones. Fair enough, though we wouldn't be doing our jobs if we didn't point out that dual cameras are a staple on pretty much every other tablet on the market. So how is that lone 720p camera? In some scenarios, the quality is borderline acceptable, but predictably, a dearth in image stabilization means you'd have to hold the tablet very still if you wanted to use it as a camera. And why would you, given that making use of the front-facing lens means holding the display away from you and reaching around to tap the shutter? Remember we said the G9 has a 10-inch sibling? That would be the 101 G9, which was announced alongside the G9 back in June. But in fact, these two come from a much larger family of slates: for each size, you can get one with 8GB of internal flash memory (like the one we tested) or a souped-up version with a 1.2GHz processor and either 16GB of internal memory or a 250GB hard drive. Across the board -- 8- and 10-inch, flash memory and HDD models -- the battery is rated for up to 10 hours of web surfing and seven hours of video. All run Android 3.2 with those video and music player tweaks, and the industrial design -- kickstand and all -- remains the same. In the case of the hard drive models, you'll find a Seagate-made 7mm Momentus Thin inside with 4GB of flash memory for storing the OS. Meanwhile, the HDD contains movies and the like -- a design meant to minimize the time the hard drive's actually spinning. Small, relatively inexpensive tablets that run Honeycomb? There's only a handful at the moment, but the pool's going to get a good deal more crowded over the coming months, with models like the Galaxy Tab 7.0 Plus, Huawei MediaPad and 7-inch Toshiba Thrive on the way. (The Kindle Fire runs a heavily skinned version of Android, but with a 7-inch display and $199 price tag we'd put it in the same category anyway.) For now, there's the 7-inch Acer Iconia Tab A100 ($330), which also runs Android 3.2, but has short battery life, even for a tablet in this size class. There's also the Galaxy Tab 8.9, which should go on sale in the states soon, but if that rumored $400 price is on the money, whose $470 price tag (that's for 16GB) means you'll be paying a premium for the pinch-thin Galaxy Tab aesthetic (and TouchWiz, if that's your bag). At the other end of the spectrum, you'll find some dirt-cheap 8-inchers such as the Velocity Micro Cruz T408 and Vizio Tablet, but in exchange for spending $50 less, you might well have to settle for something running Gingerbread. Across the board, they lack the kickstand and full-sized USB port that the 80 G9 brings. 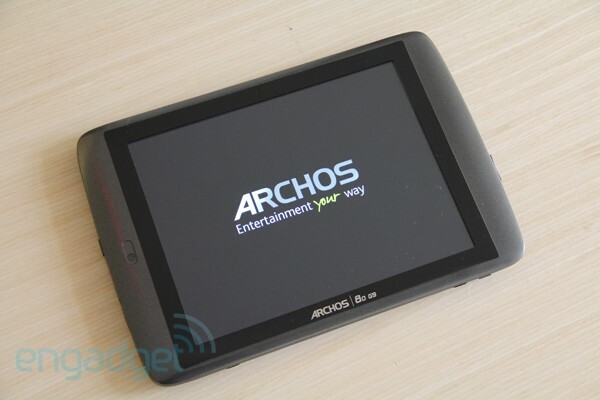 After months of testing Honeycomb tablets with similar specs, we didn't begin our review of the Archos 80 G9 expecting to be blown away. And yet, by the end of our testing period, we had grown rather attached to the thing. Curiously, there wasn't just one feature that bowled us over. The display offers excellent viewing angles, but isn't the most vibrant we've seen. Its performance is snappy enough, but nothing to write home about. It's one of the few tablets we've tested recently without a rear-facing camera. But none of that matters much when you remember this is a $300 tablet we're talking about. For what it is, its value is unmatched. Here you have an 8-inch slate running (mostly) vanilla Android 3.2, whereas some bargain-basement models costing just $50 less run Gingerbread. While its battery life can't hold a candle to a 10-inch tab, it's still quite healthy for a 7- or 8-incher. Moreover, what other tablet this small and this cheap has a full-sized USB port? Or a kickstand? Yeah, we're coming up short, too.